Al Pacino stars as a college professor who moonlights as a forensic psychiatrist for the FBI. 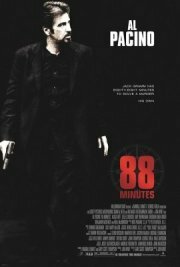 When he receives a death threat claiming he has only 88 minutes to live, he must use all his skills and training to narrow down the possible suspects, who include a disgruntled student, a jilted former lover, and a serial killer who is already on death row, before his time runs out. His problems are made worse by his unconventional behaviour, which provides ample ground to suspect that he is not as innocent as he would appear. Comments Tense action thriller with strong suspense and some graphic violence.